In a recent post, Birding for Fun and Profit, I mentioned that volunteer birders across Canada and the U.S. are instrumental in assisting with research related to wild bird populations by submission of raw data observations of kinds and numbers of birds visiting yards and gardens. Aside from the pleasure of bird watching (and complementary teasing of friends and family which invariably accompanies the hobby), is the knowledge that bird watching advances true scientific efforts. Project FeederWatch has tracked the advancement of certain avian diseases and requests its citizen scientists to report instances in their data logs. This past week, for only the second time (and first time during my “official” Project FeederWatch period), I’ve observed a bird with symptoms of red, swollen, and crusty eyes which is caused by the bacterium, Mycoplasma gallisepticum. This little guy was at my feeder this past week, unfortunately demonstrating a classic case of House Finch Eye disease, a kind of conjunctivitis caused by M. gallisepticum. This male House Finch’s eye is almost completely closed due to inflammation. First observed in the mid-1990s by Cornell feeder-watching volunteers, this disease has spread throughout the House Finch, Haemorhous mexicanus, population of North America. The poultry respiratory disease made a species leap to wild House Finch populations and because the beginning of the epidemic can be traced to a specific point (Maryland) and time (February 1994), and because Cornell Lab of Ornithology’s Project Feederwatch was in full swing, volunteers reported sightings describing House Finches with symptoms of eye disease and scientists got to work. Within a few years, reports of diseased House Finches were common throughout the U.S. With raw data provided by Cornell’s “army” of bird watchers and the creative impulse of a Cornell Lab scientist, Belgian-born ornithologist, André Dhondt, an interdisciplinary research team has studied the evolution of this new disease from its inception and analyzed its impact on a given population–in this case, the hapless House Finch. In the two decades since M. gallisepticum debuted in that small population of Maryland House Finches, the process of disease evolution–mutations coupled with population dynamics–is better understood, and scientists are now utilizing the gained knowledge towards a fuller understanding of disease spread in humans and development of immunities. For a fascinating read, check out this article: House Finch Eye Disease: Outbreak, Then Understanding. As for my little diseased finch, I haven’t seen him in a couple of days. I have noted his presence on my data for the week. Last year, I always indicated “yes” and “zero” responses to the questions of if I looked for House Finch Disease and how many finches I saw. This week, it’s still a “yes” but now with a “one.” I’ve only seen one other House Finch with crusty eyes and that was on a female House Finch in May 2016. With each passing day that I watched her, she became less able to function at the feeder. Both of her eyes were swollen and nearly closed; she would flutter until she happened to land on a branch, or the feeder, or the ground. It was clear to me that she couldn’t see well enough to fly and perch. For her, feeding became nearly impossible due to her poor eyesight. Eventually, she stopped visiting my back garden. For what it’s worth, the other eye of the finch I’ve observed this week is healthy and unimpaired and he’s flying and feeding normally. Additionally, most birds aren’t afflicted by this disease; continent-wide, American Goldfinches (which I only see in late winter) and a few others have been impacted. What to do? Well, there’s really nothing I can do to help individual birds. They might recover on their own, but more likely, they’ll starve or become prey for someone else once they’re so blinded that they cannot feed and fend for themselves. I am wiping the feeding stations on the feeder each evening with a diluted bleach/water solution, and that’s one easy way to keep the feeder clean. Feeders should be washed once-per-month, though I have to admit that I don’t do that as regularly as I should; I should make that change. Other tips for healthy bird feeding include regularly raking or sweeping the area underneath feeders and spreading feeders throughout the garden so that birds aren’t crowded. Always, if you catch a sick bird, contact a wildlife rehabilitator in your area–he/she will have the expertise to care for the sick bird. While I certainly subscribe to the dictum of letting nature take its course, we gardeners and bird watchers can help our wild ecosystem partners thrive by simple changes in our gardening and bird-feeding practices. Let’s take care of our wild birds! 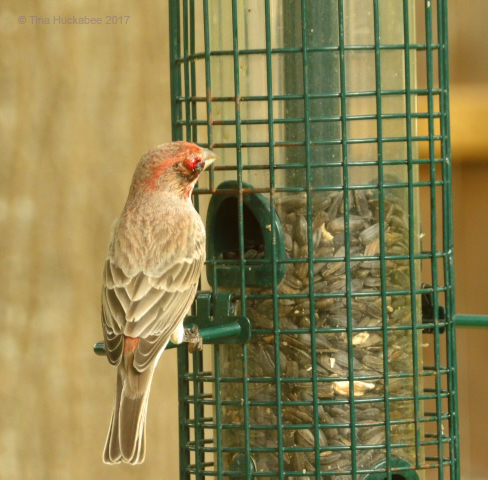 This entry was posted in House Finch Eye Disease, Mycoplasma gallisepticum, Uncategorized and tagged Backyard Birding, Bird Feeder Care, Urban Wildlife, Wildlife Gardening by Tina. Bookmark the permalink. How sad. Finches are such cheerful birds anyway. I suppose it would be just as sad if it happened to crows. Yeah, it’s a bad way to go. Finches are cheerful, I love their chatter in spring and early summer–nonstop! When I wrote about sunflowers, I described how I grew a bunch along the driveway because my neighbor asked me to. There were so many that I thought I could cut a few an bring them in and no one would miss them. I actually got away with it. I put a big bunch of them in a big vase in the middle of the table in the dining room. However, I came home from work the next day, I walked in the front door within view of the dining room, to see a huge herd of finches eating the sunflowers. There was brief pause, than, all at once, thew few out the window in a flurry of sunflower frass, dust and . . . the stuff that little birds leave behind. It was all over the place, even in the chandelier! I have not stolen sunflowers since then. In any event, this is a wonderful example of the kind of important work projects like this can do. While I’m not engaged in the feeder watch, I did manage to get decent photos of two tiny, flitty little birds at the refuge this past weekend — my first of a bird that really wasn’t eager to settle down for a portrait session! I’m going to try and make tentative IDs myself. Once I do that, I’ll see if you agree! Oh, so bad for that pigeon and for you to have witnessed it. I’m always amazed at what science (and scientists!) accomplish–they’re really unsung heroes! Flitty birds are the most challenging to photograph, but so rewarding once done! I’ll be interested to find out what you observed. I’ve seen House Finch Eye Disease a few times over the years. It’s sad to see it. I have to admit, I don’t clean my feeders during the winter–it’s too cold, and a bleach solution would simply freeze and freeze my fingers. Then again, the bacteria probably doesn’t survive long during our bitter cold winters, anyway. I’m guessing it’s more of a problem in the spring and fall here. Poor little buddies. I would imagine that your cold temps render your feeders clean. I’m going to make a better effort at cleaning mine–I only have two that the finches visit, so the work isn’t onerous. Yes: poor little buddies. It gave me the hunch that it was a Blackbird. So I gave him chicken in porridge with water and cereals. But he did not like it. I tried chicken slices and ate them like crazy. When I had a full crop, I stopped feeding him. When I was hungry, I would scream and chicken in larger pieces. Always with your hot water bag and changing the kitchen towel with your cachitas. A week had grown about three times and he left his basin to walk. It was a Blackbird, my hunch was not wrong. The following week we named him, Casimiro: all day eating. It climbed on our shoulders and went down the clothes to the ground and vice versa. I lived in the kitchen and on the terrace of the kitchen that is closed in aluminum. And there he walked. We put a larger nest and continued using it when he got tired. The plumage of the young people coming out of the nest was coming out. One afternoon my parents and I left home and when we returned we found him drowned in the bucket of the mop that by a mistake we left him full of water when he never had water to avoid accidents. How I cried to Casimiro. We had taken him forward to release him and live free with other Blackbirds. And he died that way. Excuse me, Tina for writing so much. Excuse me, please. Have a nice week. Greetings from Margarita. Well, that is a sad story. I think many of us have unsuccessfully tried to save an orphaned or sick animal. Sometimes it works, often it doesn’t. We have licensed wildlife rehabilitators here, I don’t know if that exists in Spain, but I’ll bet it does. I do feel very sorry for the little House Finch. I hope he recovers, but time will tell. Oh dear, what a sad sight. I have not heard of this disease, it must be heart breaking to see it and be unable to help. It is sad to watch. I’ve seen the little finch since posting, and (fingers crossed) the one bad eye doesn’t quite look as bad–still closed, but less inflamed. His good eye remains clear. It is so hard to see an injured creature. How sad. I am always really careful with my birdfeeder. I disinfect it every week. I’m thinking it might be better not to attract birds to the bird table. It’s hard to know what to do. Thanks for sharing this information. You get a bird lovers’ gold star! I don’t clean my feeders weekly, but I am now wiping down the feeder that the House Finches go to. Taking down your feeders for a few days is one of the suggestions that Cornell has. It doesn’t cure anyone, of course, but the infected birds move on, hopefully leaving your local population a little safer. You’re so right though, it’s hard to know what the right thing to do is. I am looking at making my own log feeders which will go on the fire at the end of a fortnight. I’ve hollowed out the centre and made little holes all around for the bird seed. All the best with your bird feeding. I do love to see them in the garden. There’s a woodpecker today.